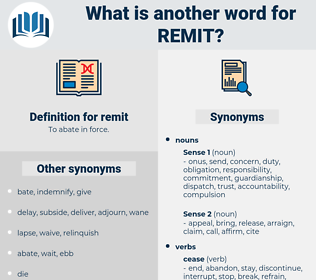 What is another word for remit? assignments, directions, designations, functions, prompts, powers, awards. mandates, data, jurisdiction, Remitting, scope, matter, expertise, task, mission, portfolio, prerogative, authority, term, job, sphere, power, vocation, proficiency, function, tenure, area, skill, skills, discretion, field. Submitted, Returned, Gave, sent, handed, called, made. 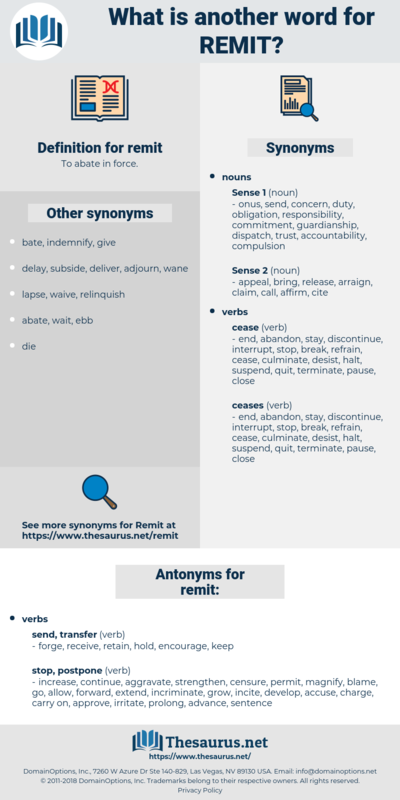 transmit, contribute, transfer, repay, defer. forge, receive, retain, hold, encourage, keep. approve, prolong, magnify, forward, irritate, advance, carry on, aggravate, continue, extend, incite, accuse, permit, worry, develop, censure, blame, allow, leave alone, raise, incriminate, go, charge, strengthen. appear, distend, chasten, burgeon, blow up, build, enlarge, correct, act, intensify, deal, increase, mind, snowball, recompense, visit, mushroom, mount, heed, work, accumulate, castigate, scourge, decide, show up, mark, punish, object, swell, sentence, soar, note, expand, grow, elongate, escalate, wax, condemn, rise, doom, lengthen, emerge, chastise, convict, balloon. These enterprises, together with the net profits of my public lectures, enabled me to remit large sums to confidential agents for the purchase of my obligations. I, if my Soveraigne would remit his quarrell. raw meat, remand, rent out, rear end, Rheum Emodi, rain date, ruminant, rear window, reanimated, rend, run out, ranid, rhymed, ruined, raw wound, round-eyed, reanimate, remote, remnant, remedy, runty, raiment, run into, rente, rimed, renewed, remuda, round out, roomette, reorientate, rind, rimmed, rear-end, rondeau, rent, rearmament, rounded, ruminate, remediate, rondo, roman deity, renowned, ramate, rheumatoid, rand, randy, ruanda, rennet, round, riant, roommate, rwanda, roundhead, rain out, reorient, rant, remount, roundheaded, reunite, rainy day, runt, remind, ranidae, ruminantia.